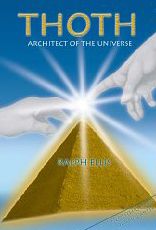 "Worth every penny if you value your sanity"
If you doubt that the story of Jesus originates in scripture not history, Randel Helms, Gospel Fictions will prove to be an enlightening read. Succinct yet erudite, in 154 pages Helms shows precisely where the evangelists found their inspiration. Any ancient writer up to the task of spinning a tale about Jesus would inevitably have been trained in the epics of Homer. Hardly surprising, then, that the trials and tribulations of Mark's hero show extensive borrowings from the Odyssey and the Iliad. 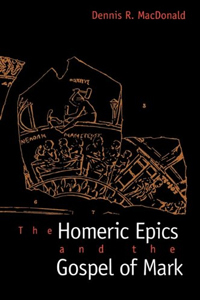 Thus argues Dennis Macdonald, The Homeric Epics and the Gospel of Mark. I finally got it, the truth I now see. This whole damn world is blind except me. For Moses I know was a fake and a fraud: he was only a man who thought he was GOD! who refuse to believe those lies we're all fed, from the moment of birth until we are dead. I just don't buy it, so don't sell it from thee, spread that lie to another just don't tell it to me!! Those people are wack and need the facade, I'd tell them my TRUTH, but they'd just yell "PRAISE GOD"
The world's favourite fable continues to morph into a plethora of alternative visions. 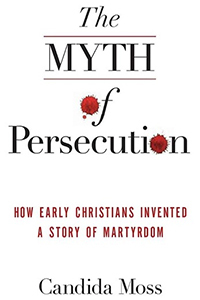 "For the first two hundred and fifty years of the Christian era there are only six martyrdom accounts that can be treated as reliable ... and when we look closely, even the earliest stories have been tampered with." 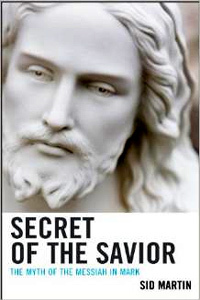 With Jesus himself a fabrication, is it any surprise that the "heroic struggle of the early Church" is a palpable fraud? 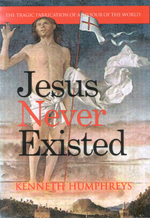 Candida Moss, professor of New Testament and Early Christianity at the University of Notre Dame, presents a highly readable yet scholarly account of how and why a triumphant Church manufactured a bogus history for itself, literally demonizing pagans, critics, heretics and all who resisted its fierce ambition. They were all agents of the devil, guilty of "persecuting" the saints. But the "persecuted" were actually in power and fables of ancient heroics justified centuries of merciless cruelty from the Church of God. "The mythical messiah whom Mark has created, then, represents the hope of the restoration of Israel following its destruction by Rome ... It is more than doubtful that either the didactic Jesus of Q or the mystic Jesus of Paul stands behind the mythic Jesus of Mark." Jesus as a cypher for Israel? Not a new idea but skillfully presented here by Sid Martin, who analyses the gospel of Mark with the thesis that not a man but Jewish history was his source. 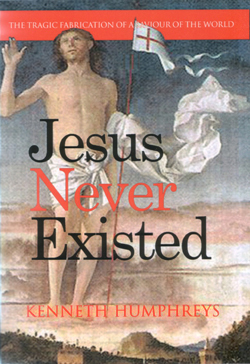 This book leaves unanswered many other questions, particularly the Pauline Christ and just how the myth mutated into a "historical figure" but a valuable read. 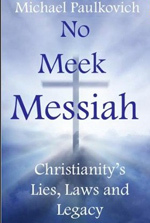 The book No Meek Messiah presents one-hundred-and-twenty-six writers from the "time of Jesus" who should have, but did not record anything about the Christian godman. We invited the author, Michael Paulkovich, to present an introduction to his work. 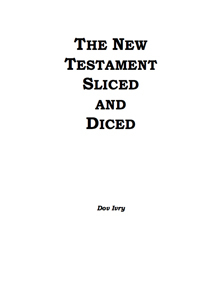 "When I consider those 126 writers, all of whom should have heard of Jesus but did not, and Paul and Marcion and Athenagoras and Matthew with a tetralogy of opposing Christs, the silence from Qumran and Nazareth and Bethlehem, conflicting Bible stories, and so many other mysteries and omissions, I must conclude this "Jesus Christ" is a mythical character. 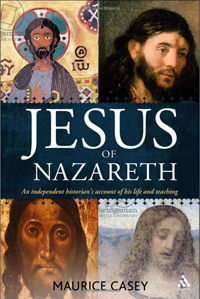 "Jesus of Nazareth" was nothing more than urban (or desert) legend, likely an agglomeration of several evangelic and deluded rabbis who might have existed." 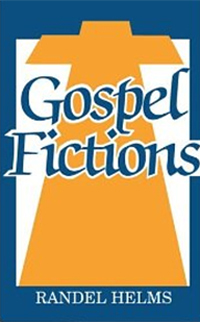 "The fundamental scholarly mistake assigns a primary role to the gospels and Acts ... However the primary sources (Josephus, Paul, and the Roman historians) suggest that two early 'Christian' movements coexisted, one led by James and the other by Paul." 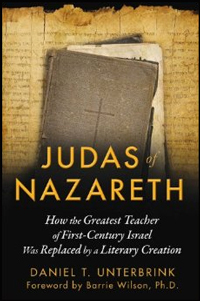 Daniel Unterbrink's latest restatement of his thesis that Jesus of Nazareth is the disguised and rewritten tale of Judas the Galilean is well worth time and attention. It isn't that he "proves" his case: he doesn't. But Unterbrink presents a welter of argument that appears at first to have great explanatory power. 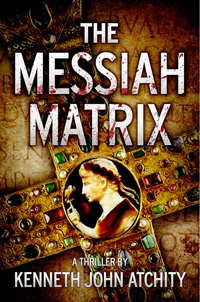 Judas of Nazareth is an engrossing read for any Jesus sleuth. 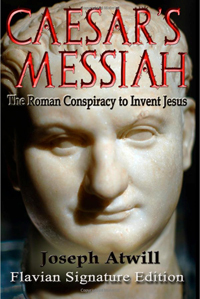 "Who would make up the idea of a crucified Messiah? … It came from historical realities." 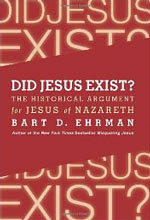 Ehrman, no longer the fundamentalist that he once was, rewrites Christian apologetics, minus the supernatural elements. 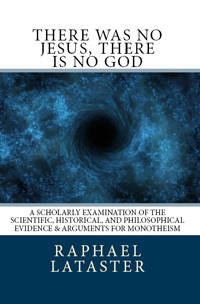 "A scholarly examination of the scientific, historical, and philosophical evidence and arguments for monotheism." 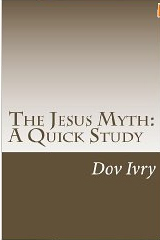 A book of two parts, the first a thorough yet readable exposition of the Jesus myth theory; the second, a rather less compelling evaluation of the arguments for God.